Leanne Lefler, Ph.D., A.P.R.N., an associate professor in the College of Nursing was recently awarded for developing an innovative approach to increase physical activity for older women. Jan. 5, 2016 | Jan. 5, 2016 | Developing an innovative approach that helped older women incorporate physical activity into their daily lives has led to national award for Leanne Lefler, Ph.D., A.P.R.N., an associate professor in the University of Arkansas for Medical Sciences (UAMS) College of Nursing. 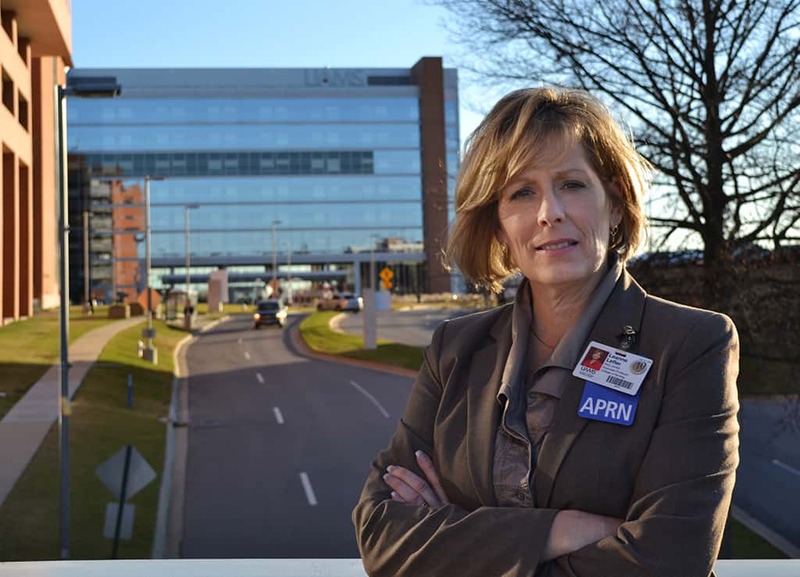 Lefler was one of ten nurses in the United States to receive the Culture of Health: Breakthrough Leaders in Nursing award from the Future of Nursing: Campaign for Action, a joint initiative of AARP, the AARP Foundation and the Robert Wood Johnson Foundation. The award honored nurses who developed innovative approaches to improve health and health care. Lefler was principal investigator on a $434,000, NIH-funded grant that worked to replace traditional, structured aerobic exercise with physical activities that are incorporated into people’s daily lives. During the three-year clinical trial, 145 sedentary women at the Thomas and Lyon Longevity Clinic in the UAMS Donald W. Reynolds Institute on Aging, age 60 and older, received specialized, motivational counseling from a social worker to help tailor physical activities to each participant’s preferences. Other honorees were recognized for promoting healthy communities, preventing and reducing child abuse, developing wellness programs for the uninsured, and improving access to healthy food and healthy living opportunities. Lefler came to UAMS in 2003 as a clinical assistant professor in the College of Nursing. She received her Bachelor of Science in Nursing in 1982 from Arkansas Tech University, her Master of Science in Nursing in 2001 from the University of Central Arkansas, and her Doctor of Philosophy in Nursing Science in 2006 from UAMS. In addition to authoring multiple manuscripts and publishing several abstracts, Lefler has worked on a multitude of research and program grants throughout her career, focusing mainly on the health of older adults. She is co-principal investigator on a $1.9 million grant funded by the Health Resources and Services Administration (HRSA) of the U.S. Department of Health and Human Services to train more nurse practitioners to provide health care for aging adults living in rural areas in Arkansas. The grant is funded through June 2018. Lefler has lectured nationally and is a Fellow in the American Heart Association. She serves on the board of directors for the Southern Nursing Research Society and American Heart Association. She maintains active memberships and supports the work of the American Nurses Association and Sigma Theta Tau International Honor Society of Nursing.